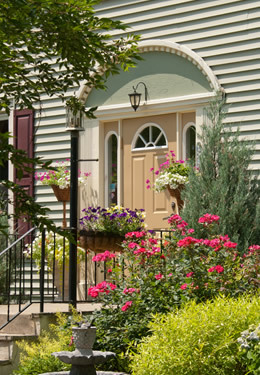 Located in Vernon, NJ, our inn is your home base for enjoying four-seasons of Tri-State recreation. Whether you are looking for a romantic getaway or an outdoor adventure, Alpine Haus Bed and Breakfast Inn is your best choice for a restful oasis. This historic 1885 Federal style home, along with its Carriage House, was the Mott homestead: one of the original farms in Vernon. The Main Inn features eight uniquely appointed guest rooms, each with a private bath, cable TV and complimentary wireless Internet service. The Carriage House provides two suites each with a gas fireplace and Jacuzzi tub. One suite is fully ADA equipped. Each morning, a bountiful country breakfast is served in our dining room. Homemade cookies, specialty teas, and our coffee/espresso machine are always on hand in the living room. Unwind on our Covered Porch with its seasonal view of Vernon Valley and the Pochuck Mountains. Many guests bring a bottle of wine when returning from their visit to the local wineries to enjoy with our cheese platter (ordered in advance) on the porch. Located in Sussex County, we border on both Orange County, New York and Pike County Pennsylvania. Outdoor adventures abound with Mountain Creek Resort located just next door where you can ski, snowboard, enjoy the waterpark, mountain bike, and ride a zip-line. Also, we are just minutes from the Appalachian Trail, six public golf courses, horseback riding, ice-skating and Wawayanda and High Point State Parks. Alpine Haus Bed and Breakfast Inn is perfect for your romantic getaway. With six wineries, several tearooms and massage services available you can create special memories. The picturesque town of Warwick, New York is 10 minutes away with 3 wineries, quaint shops and Sugar Loaf Arts & Crafts village. Your day will be complete with a variety of good area restaurants. You can review their menus upon your arrival. We are also just minutes from Crystal Springs Resort, where many of our guests attend weddings or play golf on their award-winning golf courses. Think of us for a more affordable lodging option and enjoy the B&B experience, which is so much more than just a hotel room. With many more Area Attractions, you might want to stay an extra day! Take advantage of our concierge service to plan a personalized itinerary and make reservations at the many fine restaurants in our area. Make your stay extra special and order chocolate-covered strawberries, flowers or a cheese platter to be served in the privacy of your room. Winter is a beautiful time in Sussex County. Located next door enjoy all that Mountain Creek has to offer: skiing, snowboarding, zipline (yes in the winter), tubing & nightlife. Numerous wineries and great restaurants to choose from. We hope to see you soon.